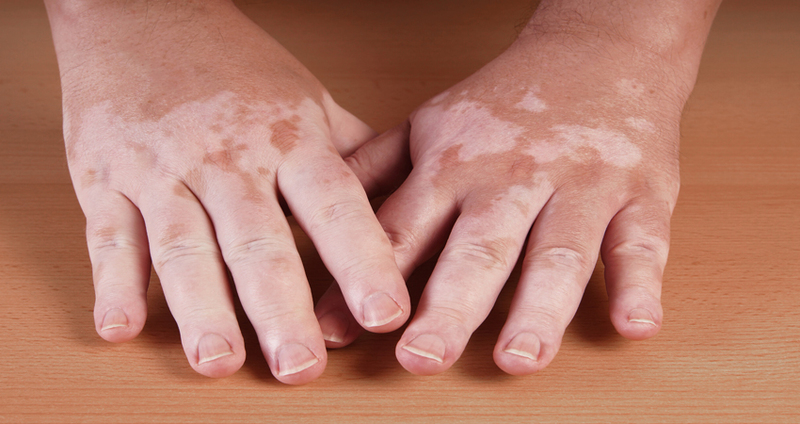 Vitiligo is considered to be either hereditary or an autoimmune disease. Our bodies produce certain proteins known as cytokines. These cytokines change the cells that produce the pigment and cause their death. Vitiligo is a skin condition that appears in different parts of the body. Wherever the color giving pigment is absent from the cells and tissues of the skin, white patches emerge on the skin. This pigmentation disorder is caused by the destruction of melanocytes. Melanocytes are cells which produce pigment that imparts color to the skin, hair and eyes. Vitiligo is also caused by sunburn and excessive emotional stress. Copper not only helps to restore the pigmentation disorder but it also keeps the body and the skin healthy and free from diseases. Take a big copper vessel and fill it with drinking water. Keep the water in the vessel overnight and drink it in the morning. This is an easy way to supplement the body with copper. Babchi is very useful for removing the white patches on the skin and restoring the normal color of the skin. It purifies the blood, increases its flow to the affected areas and helps to produce the melanoctyes. Make a thick paste with babchi powder and a little coconut oil. Smear the paste on the all the white patches early in the morning and expose the skin to the sunlight for fifteen minutes. Daily application will gradually restore the natural color of the skin. Radish seeds are very effective in removing the white spots and restoring the skin color. These seeds are rich in vitamin C which is a great antioxidant and which boosts the immunity system and has large amounts of copper which is very valuable in restoring the melanocytes cells. Grind radish seeds to a fine powder and store in a jar. Take one tablespoon of this powder and mix it with a little vinegar to form a paste. Apply and rub the paste on all the discolored patches. Repeat three times a day. Turmeric has a vast number of medicinal uses. Its antioxidant properties are very beneficial in the treatment of vitiligo. Mix turmeric with mustard oil to form a thick paste. Apply the paste all over the affected areas. Rub the paste gently on the discolored areas so that the oil and turmeric seeps into the skin. Use this paste twice daily on a regular basis. Mustard oil stimulates the blood circulation and increases the blood flow to the spots.